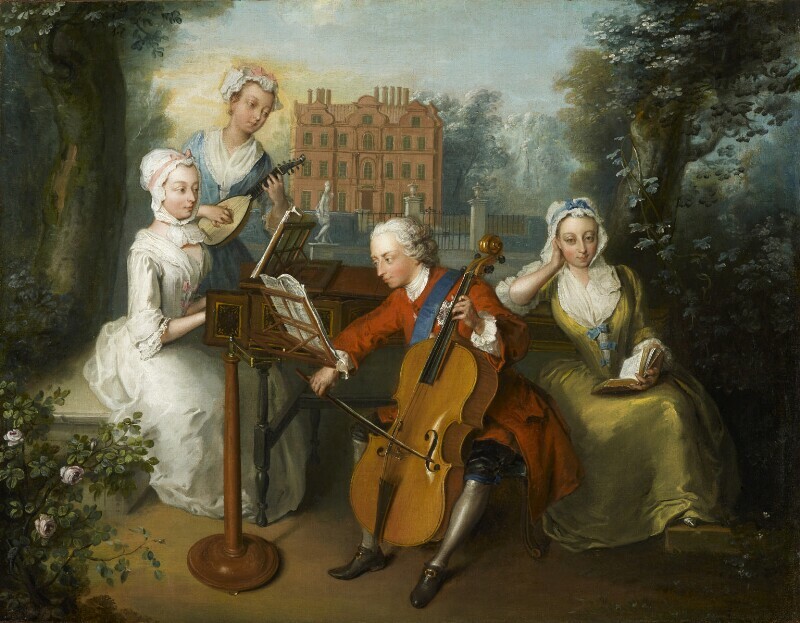 Re: The Music Party', Philip Mercier, 1733 - I am delighted that you have included my notes regarding this painting on your website. I neglected to mention that the website makes note that Frederick, Prince of Wales, is playing a Bass Viol. Although he may have also played the bass viol*, he is playing a Violoncello in this painting (and in the similar painting in the Royal Collection). The description of the instrument -Violoncello - in the National Portrait Gallery Collection Catalogue: John Kerslake, Early Georgian Portraits, 1977, is correct. * Egmont Diary, I, p.290. Errata: Regarding the widespread use of the 'screw-button, please delete '1740's'. The sentence should read: The screw button was not in widespread use in England until the 1750's. Please note that the spelling of 'English' (Concert) above is incorrect. Richard Webb, Former Baroque Violoncello: Academy of Ancient Music & English Concert. Re:The Music Party' by Philip Mercier, 1733 I am delighted that you have included my notes regarding this painting on your website. I neglected to mention that the website makes note that Frederick, Prince of Wales, is playing a Bass Viol. Although he may have also played the bass viol*, he is playing a Violoncello in this painting (and in the similar painting in the Royal Collection). The description of the instrument -Violoncello - in the National Portrait Gallery Collection Catalogue: John Kerslake, Early Georgian Portraits, 1977, is correct. * Egmont Diary, I, p.290. Errata: Regarding the widespread use of the 'screw-button, please delete '1740's'. The sentence should read: The screw button was not in widespread use in England until the 1750's. Please note that the spelling of 'English' (Concert) above is incorrect. Richard Webb, Former Baroque Violoncello: Academy of Ancient Music & English Concert. Strings: The bottom violoncello string - low C - appears to be silver wire covered gut, with the 3 upper strings being plain gut. Silver wound strings were developed in Bologna c.1660-65. Formerly a large cello-like instrument (bass violin/basse de violon) using all gut strings was used to play bass lines in baroque music. The silver wound C string (and later silver covered G string) allowed for the development of a smaller instrument - the 'violoncello' c 1700. English players did not immediately adopt the use of the new covered strings, but by 1733, they were in widespread use in England. The smaller instrument allowed ease of playing in higher positions leading to the development of an increasingly virtuosic solo repertoire. London was home to a number of performers and composers of solo violoncello music during 1730's-1740's, including Handel's friends Cervetto and Geminiani. Frederick's ebony-veneered fingerboard is indicative of the use of covered strings, being more wear resistant than maple which was formerly used. Bow: Given that the painting does not show a screw-button to tension the bow hair, Frederick's bow has a 'clip-in' frog - a typical arrangement at that date. The screw button was not in widespread use in England until 1740's - 1750's. Upon close inspection, The Rev. John Chafy is using a bow with a *clip-in frog in the painting by Gainsborough,1750-52 (Tate Gallery).